SAN JOSE, Calif.--(BUSINESS WIRE)--Jul. 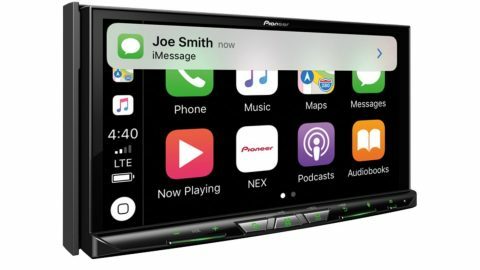 18, 2018-- Cypress Semiconductor Corp. (NASDAQ:CY), the embedded solutions leader, today announced that Pioneer Corporation has integrated Cypress’ Wi-Fi® and Bluetooth® Combo solution into its flagship in-dash navigation AV receiver. The solution enables passengers to display and use their smartphone’s apps on the receiver’s screen via Apple CarPlay™ or Android Auto™, which provide the ability to use smartphone voice recognition to search for information or respond to text messages. The Cypress Wi-Fi and Bluetooth combo solution uses Real Simultaneous Dual Band (RSDB) technology so that Apple CarPlay and Android Auto can operate concurrently without degradation caused by switching back and forth between bands. The Pioneer AVH-W8400NEX receiver uses Cypress’ CYW89359 combo solution, which includes an advanced coexistence engine that enables optimal performance for dual-band 2.4- and 5-GHz 802.11ac Wi-Fi and dual-mode Bluetooth/Bluetooth Low Energy (BLE) simultaneously for superior multimedia experiences. The CYW89359’s RSDB architecture enables two unique data streams to run at full throughput simultaneously by integrating two complete Wi-Fi subsystems into a single chip. The CYW89359 is fully automotive qualified with AECQ-100 grade-3 validation and is being designed in by numerous top-tier car OEMs and automotive suppliers as a full in-vehicle connectivity solution, supporting infotainment and telematics applications such as smartphone screen-mirroring, content streaming and Bluetooth voice connectivity in car kits. More information on Cypress’ RSDB and 802.11ac combo solutions is available at www.cypress.com/802.11ac. Cypress works with the world's top automotive companies to develop leading-edge automotive systems, including Advanced Driver Assistance Systems (ADAS), 3-D graphics displays, wireless connectivity, full-featured touchscreens and superior body electronics. Cypress’ automotive portfolio includes the Traveo™ and PSoC® MCUs, power-management ICs (PMICs), CapSense® capacitive-sensing solutions, TrueTouch touchscreens, NOR flash, F-RAM™ and SRAM memories, and Wi-Fi®, Bluetooth® and USB connectivity solutions. The portfolio is backed by Cypress' commitment to zero defects, excellent service and adherence to the most stringent automotive industry standards. Learn more at www.cypress.com/automotive. Cypress, the Cypress logo, PSoC and CapSense are registered trademarks and Traveo and F-RAM are trademarks of Cypress Semiconductor Corp. All other trademarks are property of their owners.